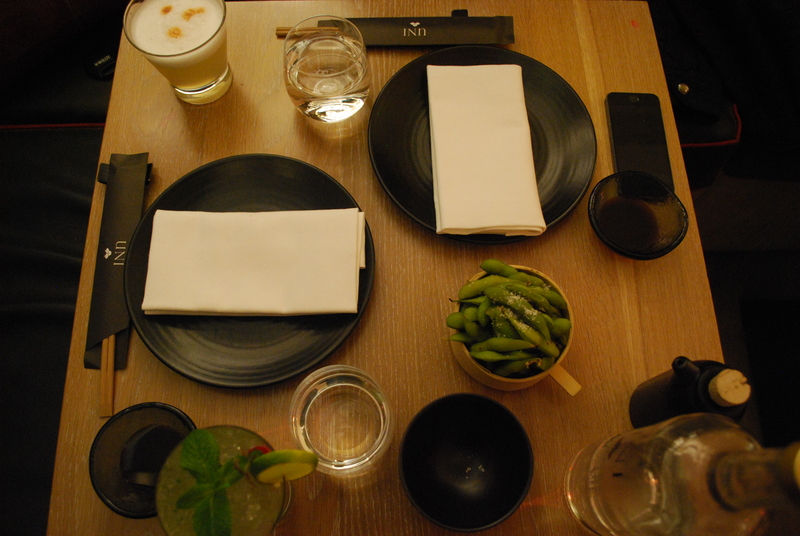 Last weekend I scored major brownie points by treating my friend to a slap up meal at Belgravia’s new Japanese Peruvian Fusion restaurant; UNI. It was safe to say he was rather impressed. It wasn’t until I emerged from the flat with an SLR camera slung over my shoulder, he realised there was a second motive to the evening. I had been invited by UNI’s fabulous PR team to come and review the restaurant, so my blogging head was firmly fixed on for the evening. Both being huge fans of Japanese food, neither of us could wait to try the dishes. Here is my UNI Belgravia Review. It was a warm September evening as we made our way to the restaurant, which is located on the corner of Ebury and Lower Belgrave Street in Belgravia. Having an office just around the corner, I know the area very well and have passed the restaurant many times. It’s in an amazing location being just 3 minutes from Victoria and about 10 minutes from Sloane Square. On arrival we were met by the restaurant manager Rafael , who gave us a warm welcome and showed us to our seats. 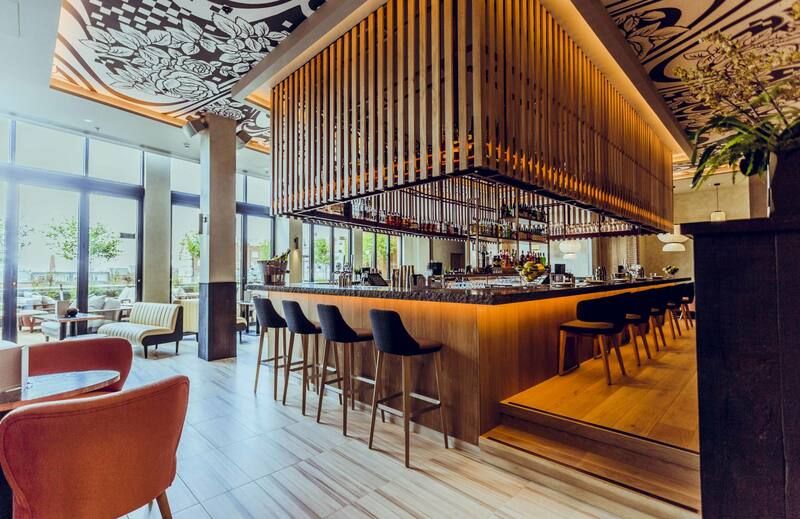 The layout of the restaurant is very cool with a sushi bar on the top floor (great for a quick lunch or solo diners) and a restaurant area downstairs (ideal for intimate dinners). I took a few snaps before sitting down to enjoy the meal. 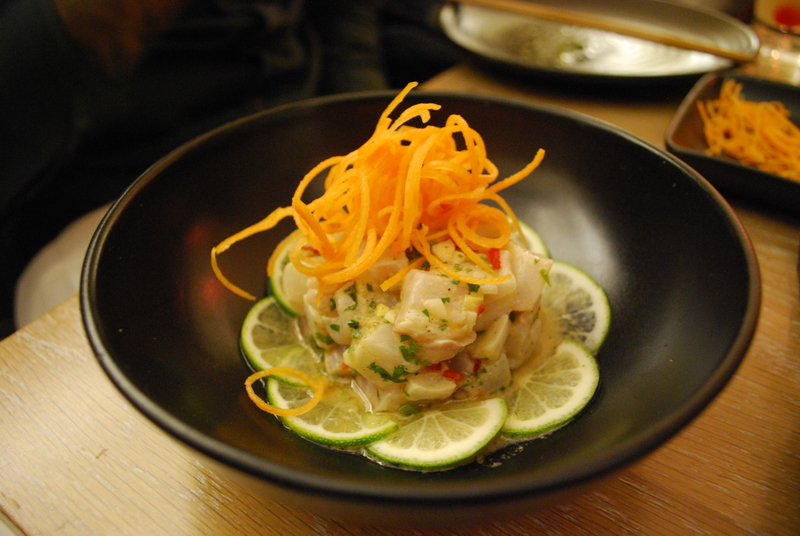 Rafael explained to us that the concept of the food was a Japanese Peruvian fusion and that the two cuisines blended due to a large Japanese settlement in Peru. 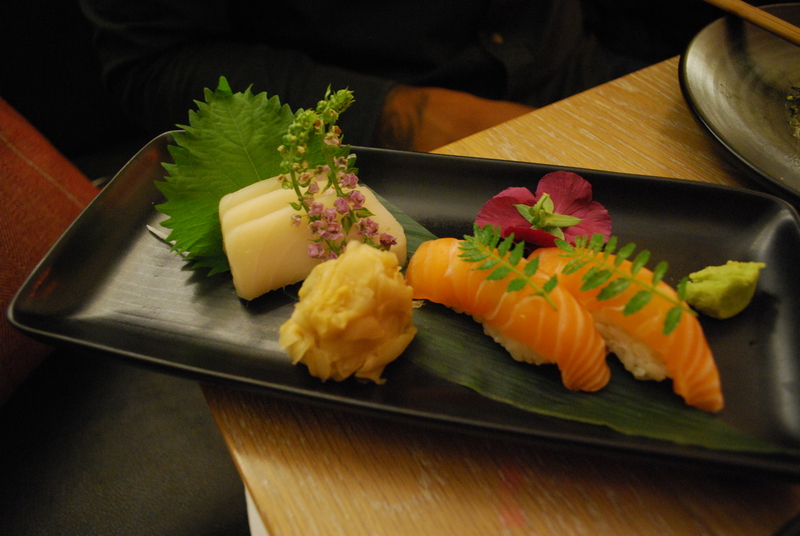 Both cuisines involving a lot of raw fish, the two flavours blended perfectly. He also explained that he had prepared a tasting menu for us with all of the restaurants most popular dishes. It sounded ideal, and he kicked off by offering us a welcome cocktail along with some warm and salty edamame beans. 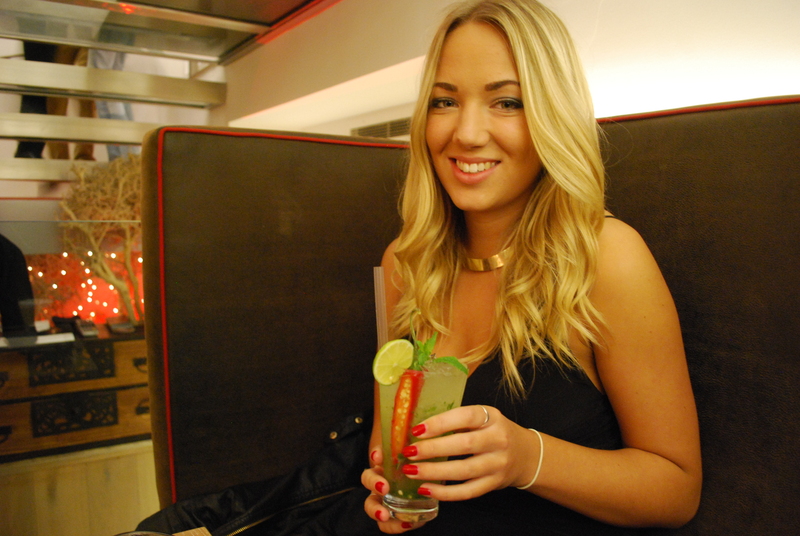 I went for a passionfruit and chili mojito, which was gorgeously exotic and not too sweet. Next came the tasting menu. 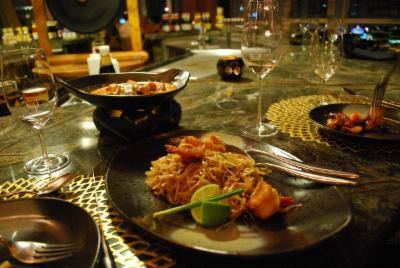 Instead of being served in courses, the many dishes were brought out in a constant flow which was really fun as we had no idea what was coming next. Shortly after the edamame and cocktails came the Salmon Tacos, which was a clear statement of how the two cuisines had fused. Perfectly marinated chunks of salmon sat within the crunchy taco parcels. A deliciously novel appetiser. This was the first time I had ever tried a Kaiso Salad, which was beautifully presented and a perfect accompaniment to the other appetisers. 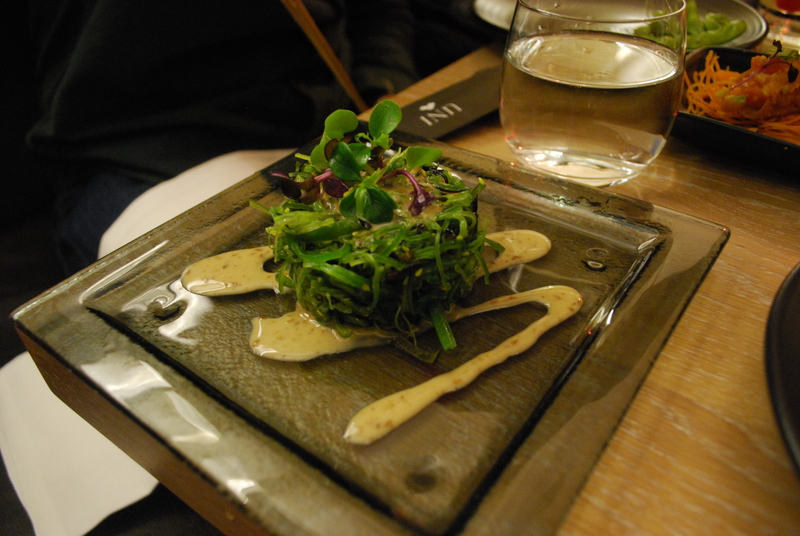 The salad was raw and infused in a soy-tasting sauce. I’ve always been a little funny about raw fish but my tastebuds are definitely maturing to enjoy it. Of course, I dug in to sample the dish and actually kept going back for more! The whole thing was so beautifully flavoured with lime juice and herbs and tasted so fresh. 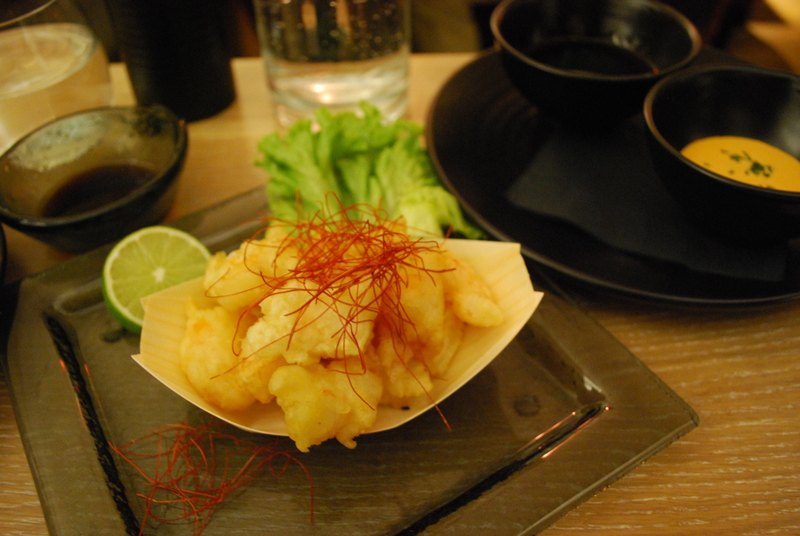 I adore prawn and shrimp tempura so I was absolutely obsessed with this dish. The batter was crisped to perfection and the shrimp was piping hot inside. What made the dish even more heavenly was a spicy mayonnaise type sauce that is served on the side. I’d have to admit to eating the majority of this dish, my friend didn’t really get a look in! My favourite dish of the meal. This little tasting plate showed just how fresh the Sashimi and seafood is and was beautifully presented along with the rest of the dishes. Apparently the most popular Maki Sushi on the Menu, we were treated to a large plate of the Crazy Roll. The sushi had avocado and crab meat rolled inside with a topping of small caviar eggs on the top. The caviar eggs gave it an amazing texture and I loved smothering these bite sized pieces in soy sauce. 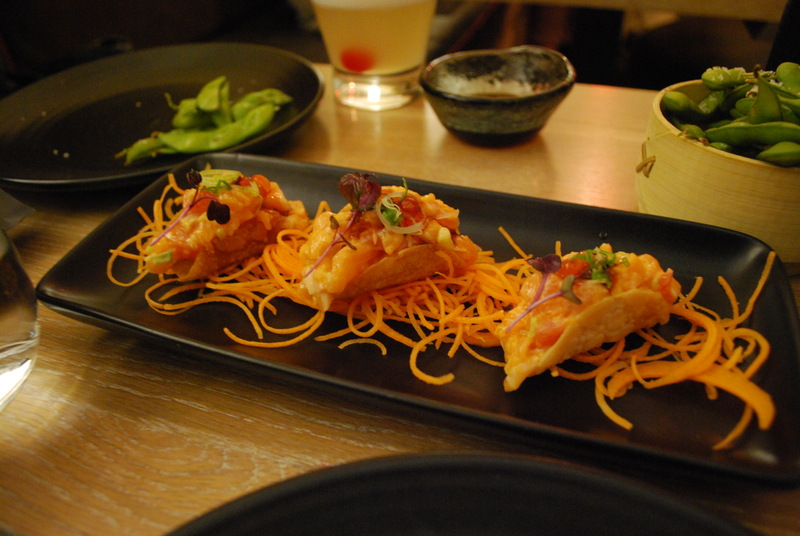 This dish is a hallmark in any Japanese restaurant, and UNI Belgravia didn’t disappoint. 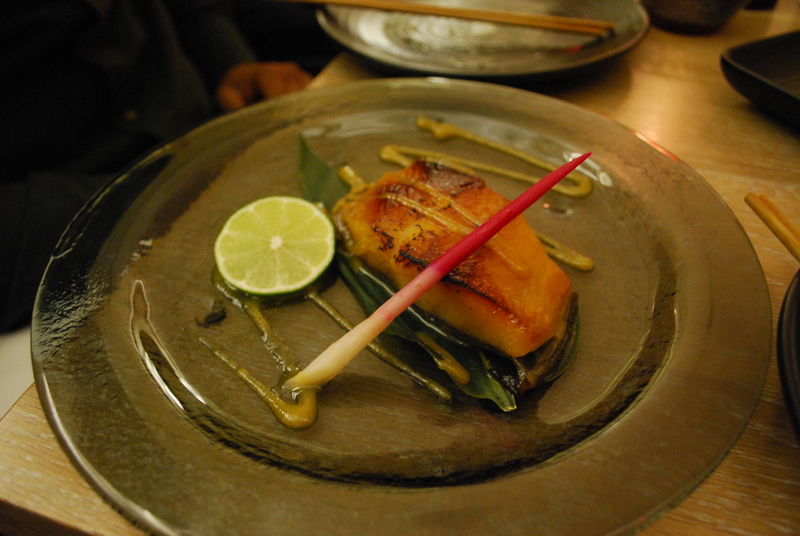 It’s marinated in a sweet and almost sticky Miso sauce (although I can never taste the miso much) and the cod is so well cooked it falls apart. I’d highly recommend this dish if you’re thinking of taking a trip to UNI Belgravia. I’ve never really thought much of Japanese desserts so never really bother to order them when I eat this kind of cuisine. However, after this dessert I have totally changed my mind. The plate had 3 different types of flavours; Lemon Chocolate and Cheesecake. The soft and chewy outer texture mixed perfectly with the cool ice-cream and was an ideal sweet treat to round off a spectacular meal. 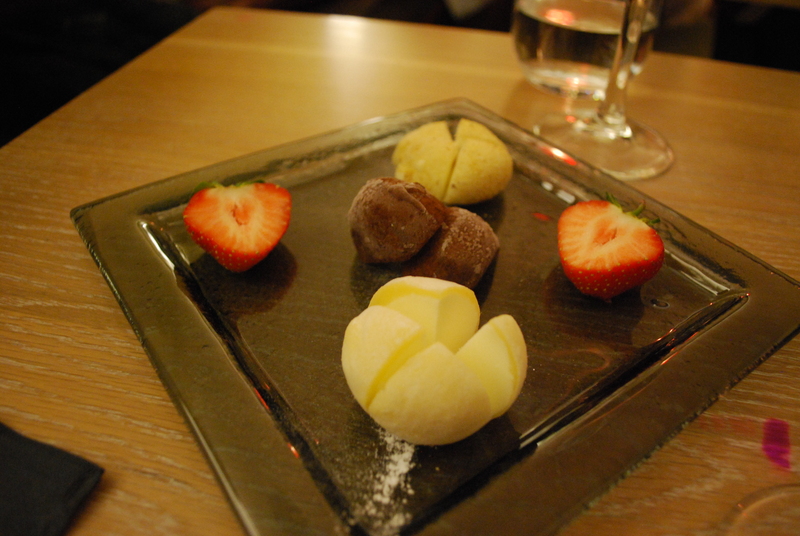 My dining experience at UNI Belgravia Restaurant London was perfect from start to finish. 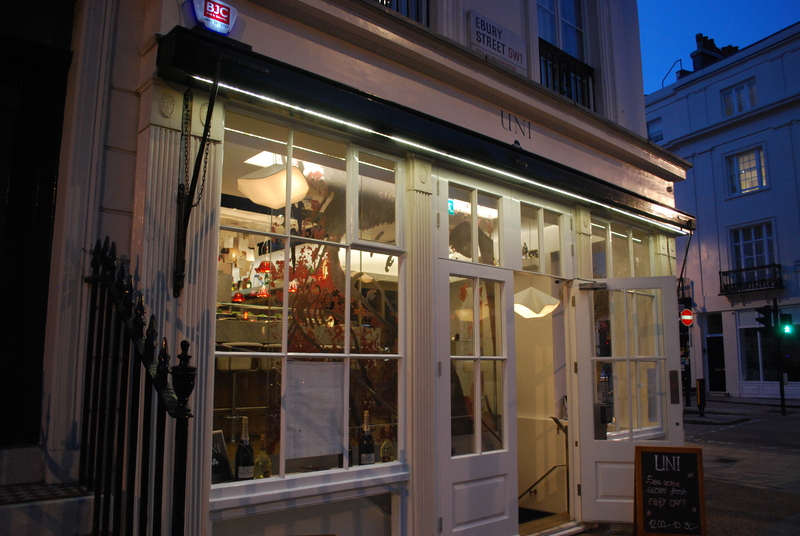 As it’s still a new restaurant, UNI feels like a little hidden gem in the heart of Belgravia. So lovers of Sushi, Japanese and Peruvian, I advise you to go and check it out for yourself, and go quickly, before the secret’s out. 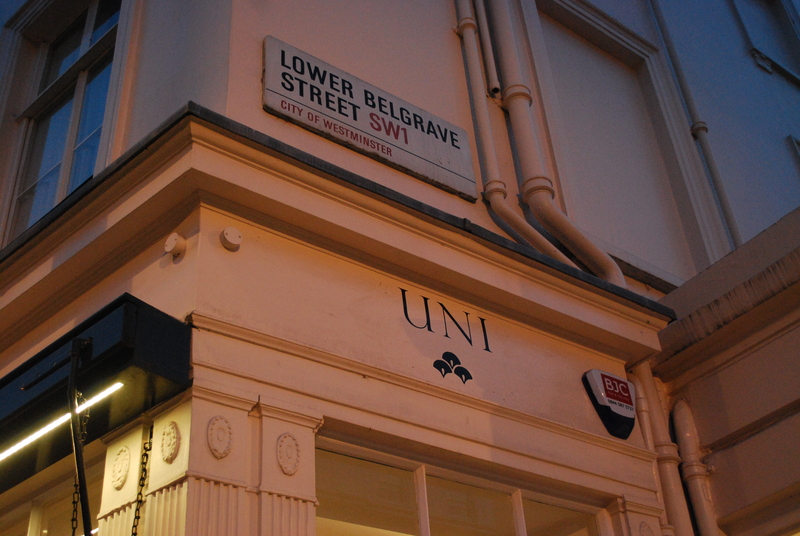 What did you think of my UNI Belgravia review? 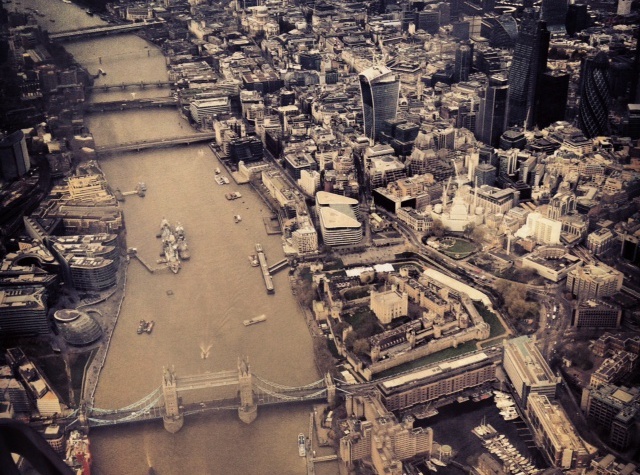 Are you thinking of visiting UNI out for yourself now? If you enjoyed this post please leave me a comment in the box below, I’d love to hear from you! 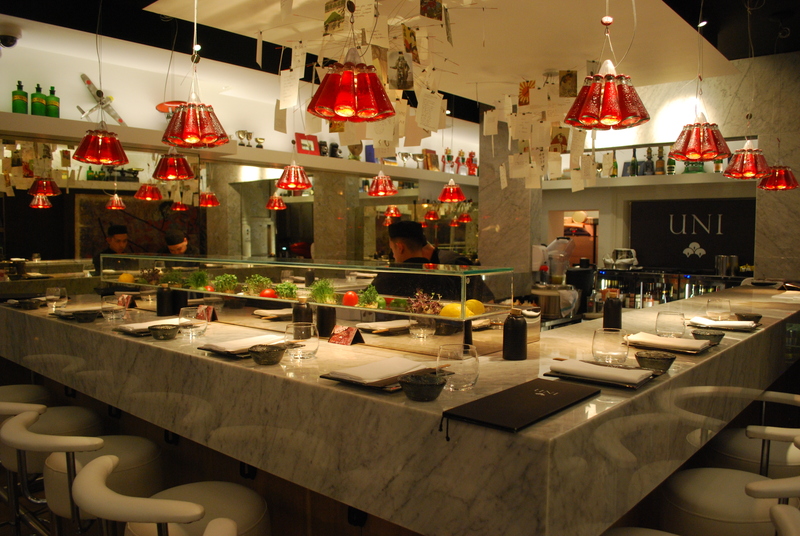 And be check out more of my London Restaurant Reviews. Disclaimer: this meal was provided complimentary by UNI Restaurant and arranged by Sadler & Co PR in exchange for a review post. Interesting mix! I’m definitely hungry now 🙂 Have you tried tsunami? 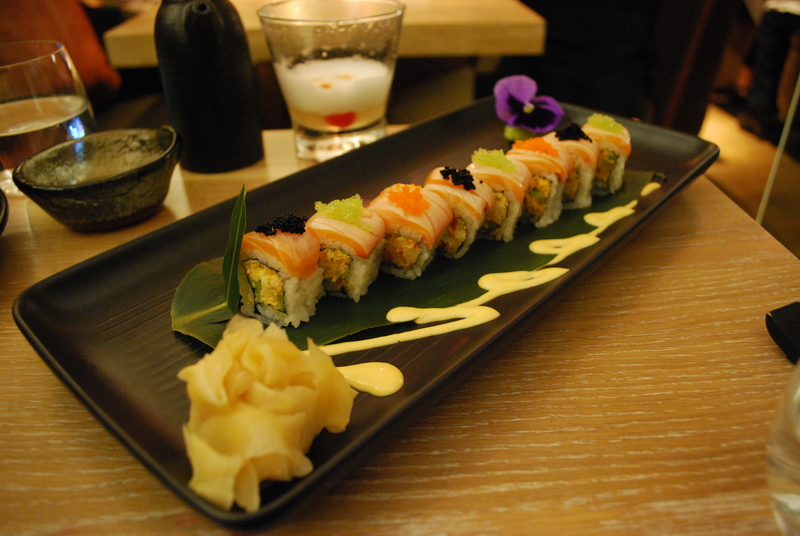 There are a couple in london, I’m assuming not as pricey as uni purely because of uni’s location, & completely delish!